Jevon Carter is one of the best players to ever play for the West Virginia Mountaineers, he’s one of the most loved and appreciated college basketball players of all time and so writing this article is not easy for me. His work ethic, the most treasured characteristic in the state of West Virginia, is unparalleled. He is a hero to all Mountaineer fans, but it must be pointed out that he absolutely had an historically bad shooting season as a rookie in the NBA playing for the Memphis Grizzlies this season. Jevon Carter is an aggressive defensive-stopper, a maximum effort guy off the bench in the NBA right now. Scouts didn’t expect amazing things offensively from him in his Rookie season. However, I’m not sure anyone expected him to finish as poorly statistically as he did. Going into his final game of his first year in the NBA, Carter is averaging 3.7 points, 1.6 rebounds and 1.8 assists in 14.5 minutes per game. He is currently shooting 27.5% from the field and 28.9% from 3 point range. In his last two games, he’s shot 3-5 from the field and 2-2 from 3PT in a 129-127 loss against the Dallas Mavericks and 3-4 from the field and 3-4 from 3PT in a 100-93 loss to the Pistons. If he didn’t shoot so well in his last two games, he would literally be on pace to have the worst field goal percentage by a player with more than 400 minutes in the last 65 years. If he shoots particularly poorly tonight in his final game as a Rookie against the Warriors, he could be the first player in modern history to shoot under 26% in a season. Of course Mountaineer fans (who insist that he is capable of walking on water) will argue, fairly, that Carter was bounced between the NBA’s Memphis Grizzlies and their G-League Developmental affiliate team the Memphis Hustle throughout the year. There were many days that he played back to back games on the same day and this grind, combined with typical first-year issues, could have perhaps led to fatigue and ultimately him struggling. In addition, his erratic, unpredictable playing time while with the Grizzlies couldn’t be easy for any player; some games he would get 20 minutes, the next he wouldn’t get off the bench. While with the Hustle, getting regular minutes (34.5 a game) Carter thrived, averaging 18.4 points, 6.5 assists and 4.5 rebounds per game while shooting 43% from the field and 39% from 3 point range. Although defense has always been his expertise, he has never been an offensive liability. While at West Virginia University, he shot 40.7% from the field and 35.5% from behind the 3 point line during his career. 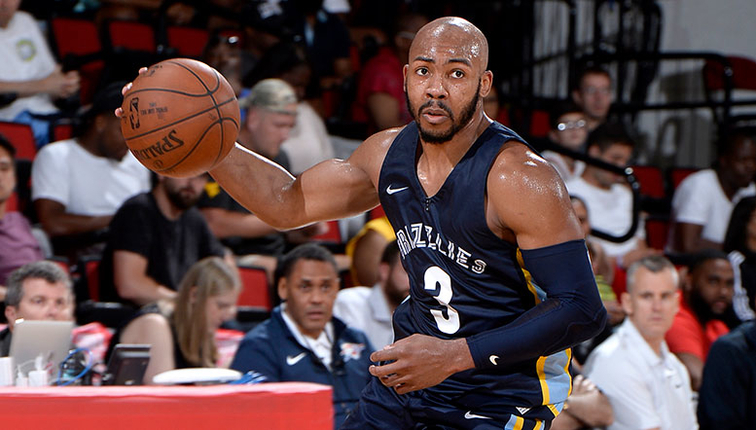 The Memphis Grizzlies want Jevon Carter to be the future point guard of the team. However, in addition to continuing to dominate on the defensive side of the ball, he must continue to develop his skills as a passer, ball handler and particularly as a shooter. Otherwise, Carter’s time as a pro will be limited to energy minutes off the bench in a backup role.